To ensure that the repeats options are given click on the "Repeat" checkbox under "Show". This will give you two options. The first is to enter an "On Repeat" phrase. This will make your bot use the alternate phrase instead of repeating the same phrase. 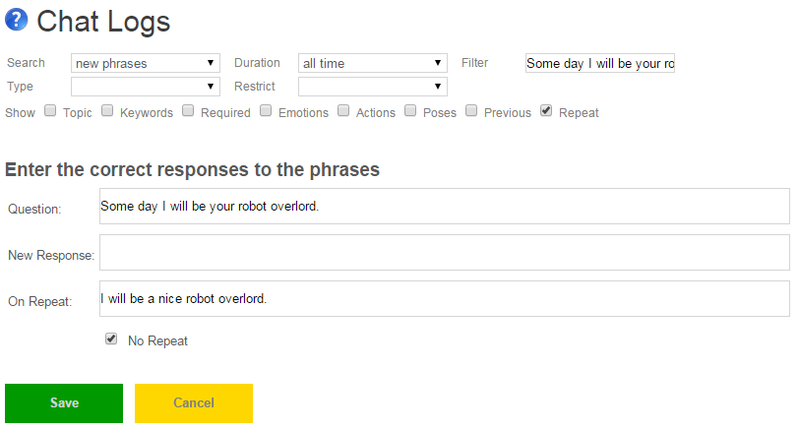 You can enter multiple On Repeat phrases, or chain them together to make the conversation progress. The second option lets you select "No Repeat". This will make the bot to not repeat the phrase or response, instead it will try to find another response. You can use repeats to avoid having the bot give the same response twice, avoid saying the same default response twice, or avoid asking the same questions or using the same greetings multiple times. You can also use "no repeat:" or "on repeat:" in a response list file to set a responses repeat options.